Archibald, a bear with a past! British Bears on the Net :: BRITISH BEARS ON THE NET :: British Bears on the Net :: NEW BEARS TO DECLARE! 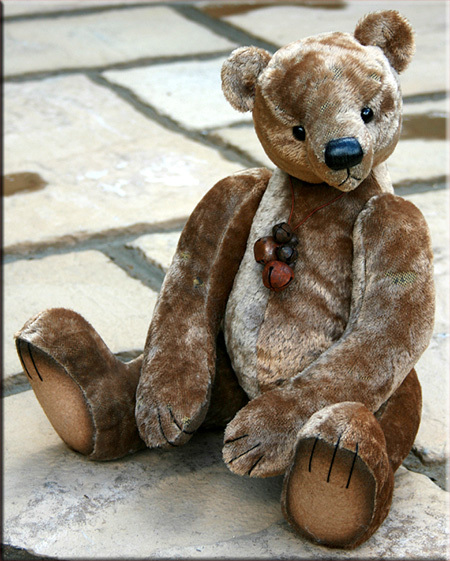 This is Archibald, a bear with a past, created for Hugglets in September. I was lucky enough to find some original antique German mohair, beautifully distressed with the passage of time and I couldn't resist the opportunity to bring it to life! Archibald is 16" and to complement the lovely patina of his aged mohair, I have given him original leather boot button eyes and a waxed, hand embroidered nose. Re: Archibald, a bear with a past! Paula...he is STUNNING!!! !...so handsome! .. I loved the last bear you made for Hugglets from this antique mohair. I have to confess I bought some of this fabric too.... a while back..but as yet have not been brave enough to cut into it! I really look foward to meeting Archibald in the fur..we are quite near to each other at Hugglets this time! I was a bit unsure of this one, so thank you for your enthusiasm! Sometimes it's hard to get my head round such a strong change of style, but it's good to work on something different for a change.